Property Owners: List your Brittany property on the premier site specialising in French holiday lets. More Info. Brittany villas and gites offer a wide selection of accommodation, and as one would expect in a sophisticated country that is geared to tourism, the French villas are always of a high standard. Brittany gites give a really authentic feel of French life, and no matter how long you stay, you’ll have a holiday to remember fondly. 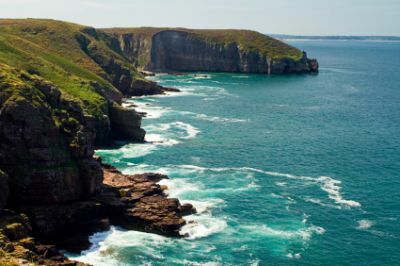 Brittany has its fair share of well-known towns and cities, but it’s also home to many places that the average tourist may never see. Try to visit Guérande, the medieval walled town. From its peninsula situation, it affords fine views over peat bogs towards the north and salt marshes towards the south. You can learn all about the thousand-year-old salt industry at Terre de Sel in Pradel, where you can also accompany a salt harvester to a salt pond. However, one of the greatest pleasures in Guérande is just strolling around the countless narrow streets and thoroughfares, visiting the art and craft shops, or popping into one of the specialist food stores to hunt down a tasty treat. For literature buffs, the town of Bécherel is a must-visit. If you’ve ever been to Hay-on-Wye, you’ll have some idea as to what it’s all about, but bear in mind that the books are in French! Notwithstanding that, it’s a joy to pass a delightfully lazy afternoon browsing around the shelves while taking in the atmosphere of the busy streets. Bécherel hosts various literary events all year round, and the main book festival takes place at Easter. A trip to Les Roches du Diable (The Devil’s Rocks) is a wonderful place to go for a walk. It’s situated to the north of Quimperlé, on the River Ellé, and offers the walker some breathtaking scenery, while if you’re feeling more energetic, you can join the canoeists as they struggle against the forces of the rapids. If that sounds too dynamic, it’s possible to hire a canoe in Quimperlé, where the river is much calmer, to meander through the waters and enjoy the sights in and around the town. The village of Pont-Aven (after which Brittany Ferries flagship is names), also known as the village of artists, is a most beautiful and tranquil spot to spend a sunny day or two. It’s associated with Paul Gauguin, the post-impressionist painter, and after following some of the riverside walks, you’ll understand why he and other artists flocked to the site. On August 1st, Port-Aven holds a lively summer festival, with traditional music and costumes, dancing and regional food. It’s a fantastic occasion for all concerned. As with most regions in France, Brittany has its own culinary delights. Fish and seafood are fresh and plentiful, and Cotriade, a type of fish stew, is always worth trying. Among other specialities on offer are Galettes; large, thin buckwheat pancakes stuffed with a variety of savoury fillings. It’s very common to find a cold Galette wrapped around a hot Breton sausage made from pure pork, as they are sold everywhere as Brittany’s answer to fast-food. Whilst they should be consumed with a drink of Breton buttermilk, they are also widely accompanied by cider, which is produced locally. Finally, a visit to Brittany would not be complete without sampling some of their local beers, which bear testament to their long and successful history of brewing.